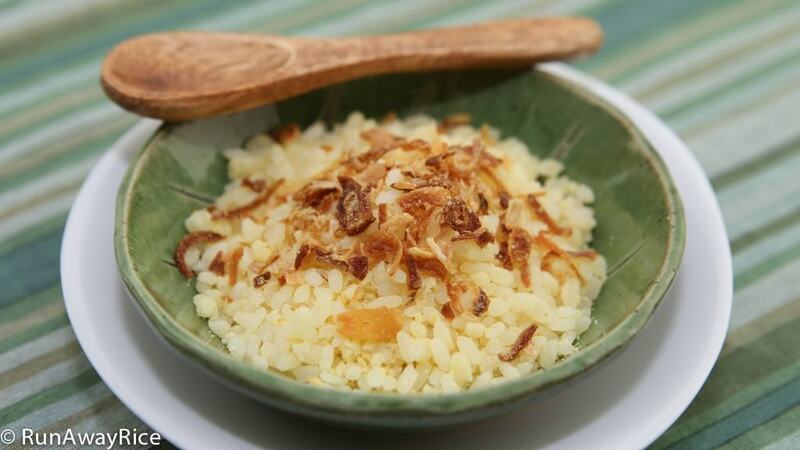 This classic recipe for Sticky Rice Coated with Mung Bean (Xoi Vo) is a guaranteed winner! What is better than enjoying plump grains of sweet rice infused with rich coconut milk, coated with ground mung bean and then steamed to a perfectly chewy and delicious texture? Oh yum! 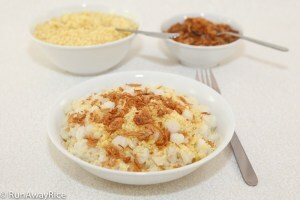 The indicator of success with this dish is to have separated grains of rice completely covered with ground mung bean so the rice is yellow rather than its original white. This may seem like a simple task but there are some key techniques to achieve just the right texture and taste. So before you start cooking, please review the video and my notes below. Good luck and enjoy the recipe! I prefer short-grain sweet rice for this recipe. The short-grain or round sweet rice is visually appealing because it gets nice and plump when steamed and it’s also easier to keep these grains separated compared to the long-grain sweet rice. Soaking the sweet rice is essential for achieving a chewy texture. If you’re short on time, you can soak with hot water for 4 hours. Soaking overnight is best and it doesn’t have to be exactly 8 hours. Anywhere between 8-12 hours is just fine. The cooked mung bean needs to be finely ground so it’s powdery and flour-like. This texture will help the beans to bind to and coat the sweet rice. Process the mung bean in intervals of 10 seconds, stop the food processor to stir the beans and then continue processing. When steaming, use the steamer tray with the smaller holes. If your steamer tray has the larger holes, line it with cheesecloth or banana leaves. 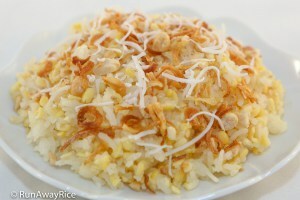 Add more coconut milk syrup during steaming if you like it richer but don’t add so much that the rice becomes soggy. Alternatively, you can save the coconut milk syrup and drizzle some on top when serving. Keep the water level in the steamer basin low–fill just 1/4 of the steamer basin with water. Too much steam will make the sweet rice and beans very sticky. It’s important to wrap the steamer lid with a kitchen towel to remove any excess moisture. Some lids collect water which then drips down making everything soggy. Using a towel takes care of this, so don’t skip this step. Refrigerate any leftovers and enjoy within the week. This dish freezes really well (up to 3 months). Store in resealable plastic bags or air-tight containers. To reheat, microwave on High for 90 seconds. This makes an awesome and fast breakfast! Put the sweet rice into a large bowl. Fill the bowl with cool water and then wash the rice by swishing in the water for 30 seconds. Pour out the rinse water. Repeat the washing process one more time. Fill the bowl with cool water and let the rice soak for at least 8 hours or overnight. Put the mung bean into a medium bowl. Fill the bowl with cool water and then wash the beans by swishing in the water for 30 seconds. Pour out the rinse water. Repeat the washing process two more times. Fill the bowl with cool water and let the mung bean soak for at least 8 hours or overnight. Pour out the water from the beans and rinse again with cool water. Transfer into a colander and toss the beans in the colander to remove any remaining water. Set aside and allow to air-dry while continuing with the next steps. Pour out the water from the rice. Gently rinse one more time and then drain well. Add the coconut milk and water and combine together with the rice. Allow to rest for 2 hours. Fill 1/4 of steamer basin with water. Bring to a rapid boil over High heat and then reduce to Medium. Add 1/4 tsp salt to the beans and combine together. Transfer the mung bean into a steamer tray and spread out into a thin and even layer. Steam for 20 minutes or until the beans are soft and can be easily mashed. Allow to cool for 15 minutes. Transfer the beans to food processor and grind until fine, approximately 2-3 minutes. Pour the sweet rice mixture into a colander and reserve the coconut milk. Stir the rice a few times and allow to drain for 10 minutes. Measure out 1/2 cup coconut milk mixture. Add the sugar and stir until dissolved. Transfer the drained sweet rice into a large bowl. Add half the ground mung bean and combine well. Add the remaining mung bean and 1/2 tsp salt. Combine together well. Fill 1/4 of the steamer basin with water. Bring to a rapid boil over High heat and then reduce to Medium. Transfer half (approximately 4 1/2 cups) of the sweet rice and mung bean mixture to the steamer tray. Spread out into a thin and even layer. Steam for 8 minutes. Drizzle 6 tsp coconut milk mixture onto the sweet rice and mung bean. Combine together. Steam for 8 minutes. Drizzle 6 tsp coconut milk mixture onto the sweet rice and mung bean. Combine together. Steam for 4 minutes. Transfer to a large baking pan and spread out evenly. Use chopsticks to break up any larger chunks. When cool enough to handle, massage the rice using your fingers to separate the grains. Repeat the same steps as above to make the second batch. 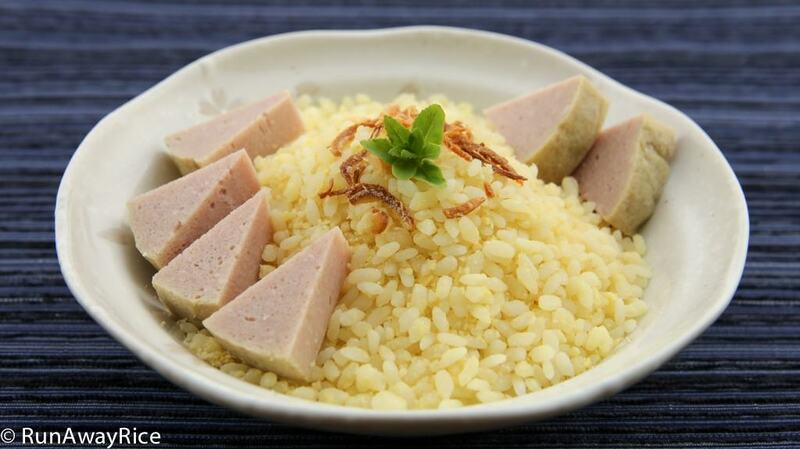 Enjoy the Sticky Rice Coated with Mung Bean at room temperature. Serve with Steamed Pork Roll for a delicious meal! I made a double batch, one to enjoy now and one to freeze for later. 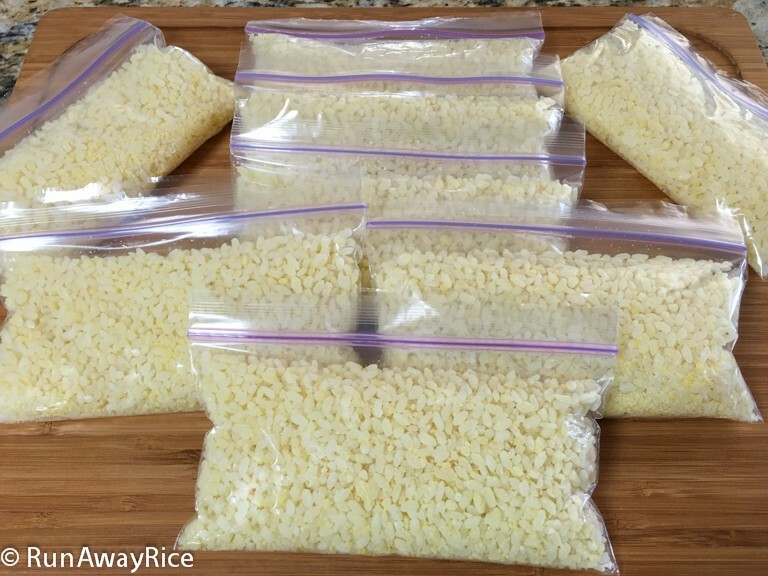 I divide the batch for the freezer using these single-serving snack bags. To reheat, simply warm in the microwave for 90 seconds. At room temperature, it should be good for 2-3 days. Any longer than that, the rice and mung bean becomes dry. Good Luck! I made this dish during the weekend and gave some to my friend . She told me her mom think what I made is better than store bought. LOL. Just thought I share the compliment with you. Thanks for sharing the recipe. That’s so wonderful! That means you did an amazing job! I always find the store-bought version is never as good as homemade. It’s been sitting on the shelves for too long.